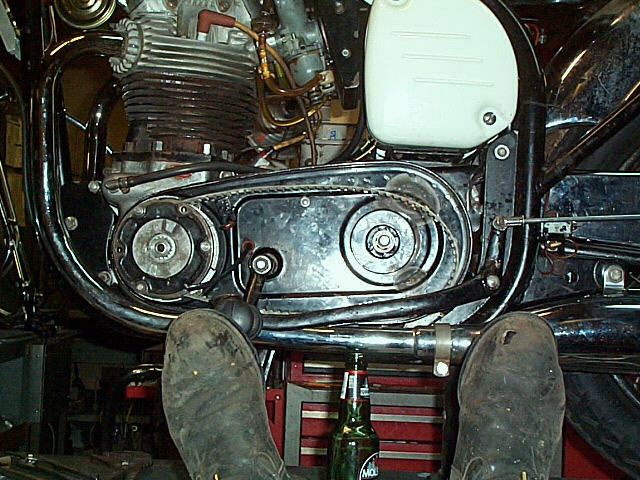 The RGM belt drive in this bike, my 63 norton atlas, was made from a 32mm AT-10 commando pulley cut down to 25mm. The 980mm was gotten locally from a belt supplier. The standard RGM commando clutch drum was used. The standard solid fiber friction plates were used. An additional steel clutch plate to make it operate deeper in the soft region of the diaphragm clutch. The commando clutch hub was supplied by RGM, already modified to be used with an atlas/dommi transmission shaft. The following pix is of the side of my bike viewing the primary side. The problem of biggest concern was that the clutch drum wobbled more than 6 drunk sailors. 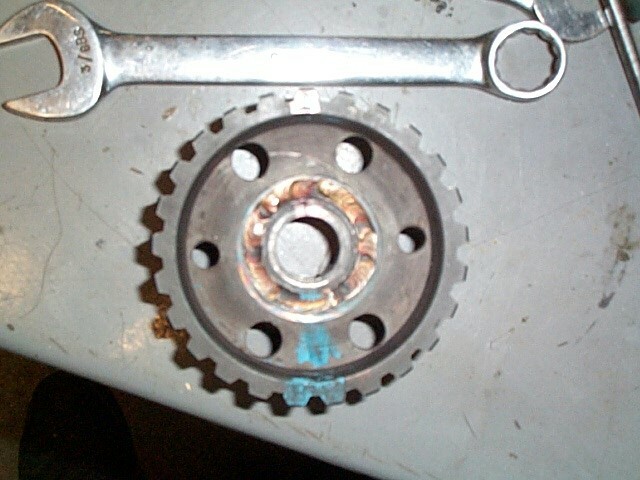 It was discovered that the hub's welded in locating washer was not perpendicular to the shaft. A measurement in the back of the clutch hub, on opposite sides of this small bore.showed that there was .006" diference of depth to the washer. There was about .035" of wobble on the edge of the clutch hub. The drum wobble seemed enormous. The weld that was retaining the washer was cut out on a lathe. The hub was trued in the lathe and then a skim cut was made to reveal that rather than a weld shrinkage/pull that was originally suspected, that the bore job was indeed at fault and enough of a cut was made to square up the bottom of the washer pocket. 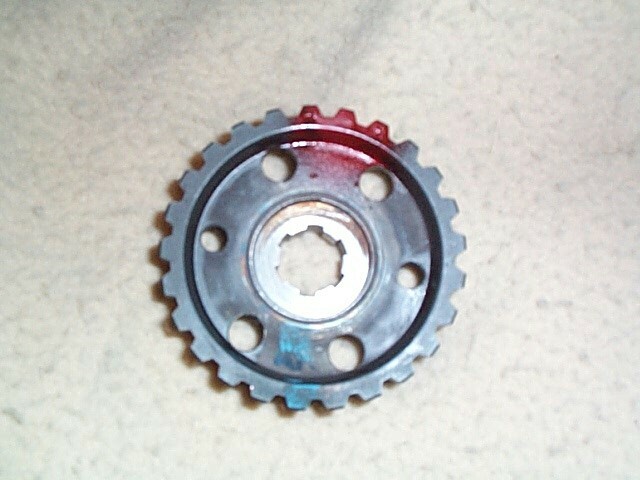 A new washer was made of oil hardening steel for reinstallation into the hub. In the pix you can see at the blue 6 oclock position the machining has cut clean new metal, and at red 12oclock it has not finished cleaning up as evidenced by the darker crescent shaped pattern. A fixture to help hold the washer in place for welding. The reworked clutch hub with hardened washer is now down to .003" of wobble. Of course you don't think i would fail to put one of my atlas clutch rod seals! The next chore was to space out the alternator. 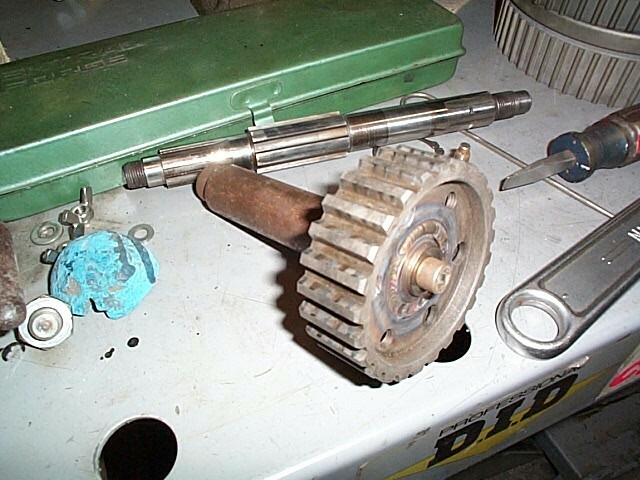 The original alternator stator holder casting had been damaged by a primary "chain come off excursion". A Norvil MC casting was obtained and it's installation was attempted. I made my own stator stud/spacers .400" long stand off length, 1/4-20tpi studs inboard to screw into the helicoiled housing and 5/16-24tpi studs outboard to centralize the stator. When all was assembled, the rotor was rubbing against the stator. 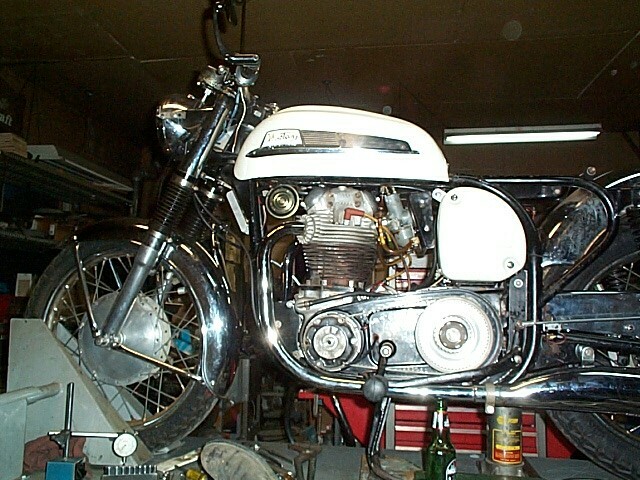 A genuine norton casting was "borrowed" from my 68 dunstall, the studs were installed on it and the rotor had ample clearance all around. To conclude, the Norvil MC casting lacked manufacuring accuracy for use with my belt drive. It will likely work OK in a standard primary where the location of the stator is not affected by the precise location of 1/4" retention studs.